France has once again been the scene of the “gilet jaunes” (yellow vests) demonstrations against the worsening social conditions of workers under the neo-liberal policies of La Republique en Marche government of President Emmanuel Macron. Protests on January 26 attracted tens of thousands continuing the 11 weeks of disturbances where many have been injured, hundreds arrested and several people have lost their lives. On January 26 there was another social variant to these developments where an alternative group calling themselves the “foulards rouges” (red scarves) said they would go into the streets the following day to oppose the level of violence which has been a hallmark of the French manifestations. The Macron administration in the early weeks of the unrest withdrew the price hike for fuel which served as a spark for the spontaneous uprising. The situation in France is indicative of broader crises in the political systems in the leading capitalist nations, namely England and the United States. In Britain, a June 2016 referendum mandating the country’s exiting of the European Union (EU) immediately brought about the resignation of Conservative Prime Minister David Cameron leading to the ascendancy of his successor Theresa May, who has been proved incapable of winning support within the parliament for a planned departure from the continental body. May has faced two votes of no-confidence, the most recent by a razor thin margin, while the Conservative leader remains almost powerless as it relates to providing direction in such a profound political quagmire. In the U.S, a 35-day partial closing of the government impacting at least 800,000 federal workers along with tens of millions of others depending upon public services was a clear reflection of the intractable dispute between the two leading capitalist parties. The Democrats and Republicans are both imperialist in their orientation although having different demographic constituencies, they therefore cannot agree on issues such as healthcare, immigration and border security. 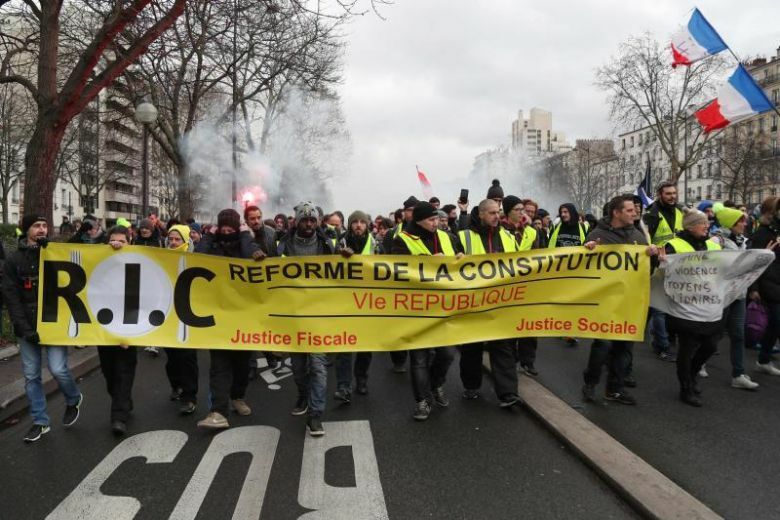 For the 11thstraight week the yellow vest protests continued in various French cities. On January 26 media estimates suggested that some 70,000 people took to the streets demanding a shift in the economic policies of Macron apart from his resignation. Since November 17, two thousand people have been injured in the demonstrations where participants have blocked streets and roads along with damaging toll machines on the highways in order to emphasize the rise in fuel prices. Areas lived in and frequented by the more affluent have been trashed by elements within the yellow vest movement. Ten people have been reported killed in direct connection with the unrest. Although the numbers of those coming into the streets have declined in recent weeks, with some four thousand marching in Paris on January 26, the demonstrators remain a significant force in disrupting normal operations in France. Macron has responded to the more than two months of marches and rebellions, by abandoning some of the “reforms” which ignited anger among working and middle class people. In addition, the president has called for a “debate” on the issues which have generated so much controversy. Nonetheless, Macron has refused to step down from office. The alternative intervention which occurred on Sunday January 27 when several thousand people marched against what they described as the violent character of the yellow vest protests will require a further assessment of its significance and viability. 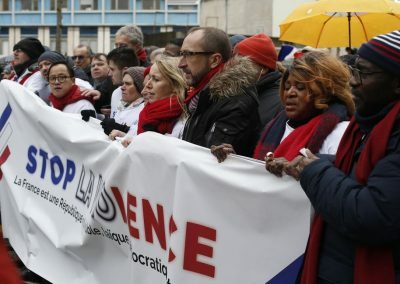 The ‘foulards rouges’ (red scarves) demonstration was carried out in defense of the Fifth French Republic saying that the participants agreed with some aspects of the demands of the ‘gilet juanes’ related to the rising cost of living. Nonetheless, they categorically rejected the violence which has occurred since mid-November saying it threatens the very character of what they perceive as the positive aspects of French society. Interestingly enough, there were African immigrants placed in the frontlines of the red scarves protest in Paris with some quoted as saying by moving to France they were seeking to escape the instability within their countries. Although this lack of stability and sustainable development is the result of the legacy of colonialism which France and other European states have played such an integral part. Some of the yellow vest supporters are dismissing the red scarves as pawns of the Macron ruling party. One possible explanation for the paucity of people of color in the leadership of the yellow vest protests is the general character of the French legal system which has been accused of persecuting Africans and Middle Easterners. 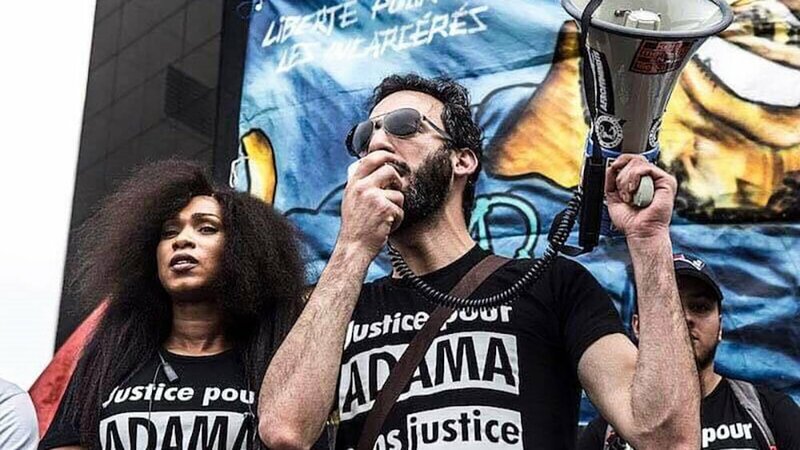 The Adama Committee, which rose up surrounding the death in detention of 24-year-old Malian immigrant Adama Traore, say that they joined the recent demonstrations despite the failure to place racism at the center of the demands. There appears to be no end in sight to the political turmoil in Britain since June 2016 when the majority of the electorate voted to leave the EU (Brexit). The then Conservative Prime Minister David Cameron immediately resigned paving the way for Theresa May to work out a program for leaving the continental body that would not cause further economic damage to London. However, repeated attempts to pass exit legislation in parliament have failed miserably. May has remained in office despite widespread displeasure with her leadership. After surviving two no-confidence votes in recent weeks, the British government faces the possibility of a “no deal exit” where the terms for their departure will largely depend on the decisions of the European parliament. The Labor Party alternative headed now by Jeremy Corbyn has drawn the support of some elements among the Marxist left. Nevertheless, how far will a Corbyn government, if elected, be willing to go in regard to instituting a socialist-oriented economic program for Britain? Leading left organizations along with the some right-wing parties supported the exit from the EU in 2016. In recent months there has been a demand for a “revote” on Brexit with the idea that the majority may have shifted towards remaining in the imperialist construct. Yet there is no identifiable popular opposition that can point to a revolutionary way forward for the working class and oppressed in Britain. There has been much propaganda from the Trump administration about the purported “booming, full-employment economy.” The official jobless rate is 3.9 percent, rising two-tenths of percentage points from 3.7 earlier in 2018. Capitalist media outlets play down this rise in the unemployment rate by saying that more people are unsuccessfully looking for jobs due to positive economic data over the last two years. Despite the 3.9 percent unemployment figure, the Labor Force Participation Rate remains at a crisis level of 62.7 percent. Consequently, many people are still discouraged with the character of the labor market going into 2019. Plant closings announced by General Motors in November 2018 in both the U.S. and Canada, portends much for the auto industry in the current period. The tax dollars of working people bailed out the car industry simultaneously with the banks and insurance companies after 2008. Therefore the ruling class interests benefitted from government intervention while working people, African Americans, Latinx and others slipped further into economic decline. Both Democrats and Republicans represent the ruling class in the U.S. and internationally notwithstanding the existence of divergent constituencies at their base. Although there was a shift within the House of Representatives after the November midterm elections towards more women and people of color, the commanding heights of power within Congress remains under the control of the conservative and centrist forces within the Democratic Party. The putative “left” of the party is by no means socialist in any genuine sense particularly as it relates to international questions. The Democratic Party is still pro-imperialist as indicated by continued support for the State of Israel, the hostility towards Syria, Iran and Russia and the failure to oppose the Trump administration’s attempted coup against the Bolivarian Republic of Venezuela. In order to reverse the contemporary crises there must be a new political alliance centered among the proletariat and the oppressed where the rights of the majority are held as paramount. Consequently the Pentagon war budget should be eliminated and the abolition of racism, national oppression, gender discrimination and xenophobia would have to be the cornerstone of creating a free and just society.